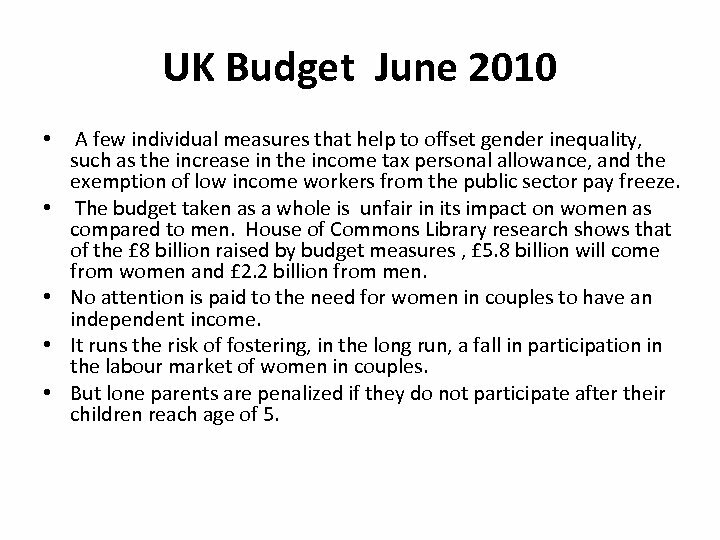 UK Budget June 2010 • • • A few individual measures that help to offset gender inequality, such as the increase in the income tax personal allowance, and the exemption of low income workers from the public sector pay freeze. 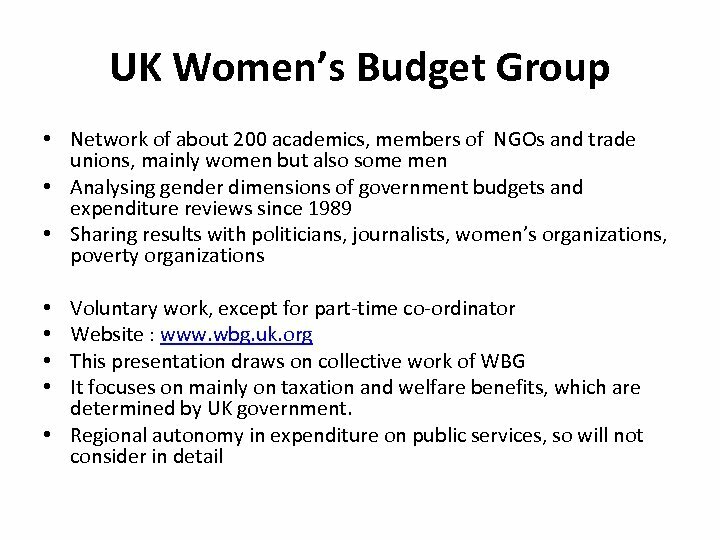 The budget taken as a whole is unfair in its impact on women as compared to men. House of Commons Library research shows that of the £ 8 billion raised by budget measures , £ 5. 8 billion will come from women and £ 2. 2 billion from men. No attention is paid to the need for women in couples to have an independent income. It runs the risk of fostering, in the long run, a fall in participation in the labour market of women in couples. But lone parents are penalized if they do not participate after their children reach age of 5. Changes to Child Benefit and Grants to New Mothers • Child benefit was a universal benefit, not means tested, usually claimed by the mother of the child, and up-rated in line with Retail Price Index. 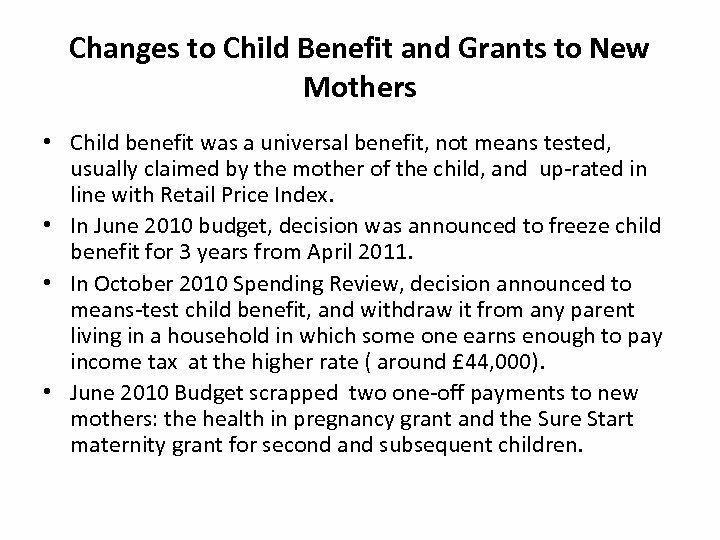 • In June 2010 budget, decision was announced to freeze child benefit for 3 years from April 2011. • In October 2010 Spending Review, decision announced to means-test child benefit, and withdraw it from any parent living in a household in which some one earns enough to pay income tax at the higher rate ( around £ 44, 000). • June 2010 Budget scrapped two one-off payments to new mothers: the health in pregnancy grant and the Sure Start maternity grant for second and subsequent children. 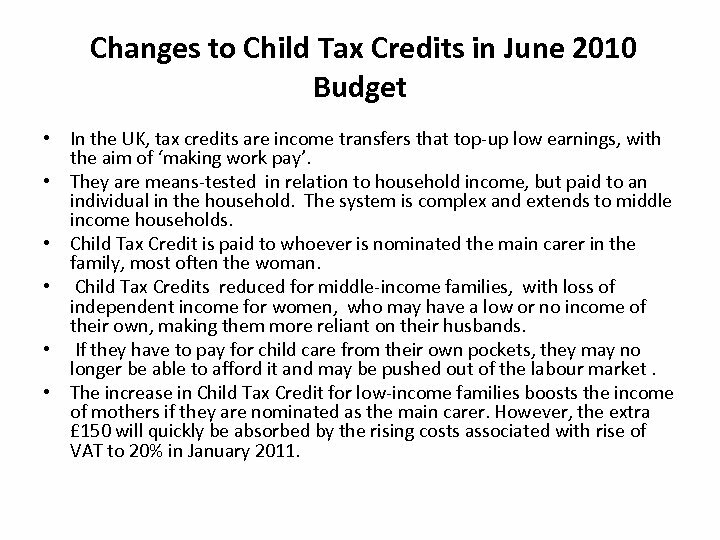 Changes to Child Tax Credits in June 2010 Budget • In the UK, tax credits are income transfers that top-up low earnings, with the aim of ‘making work pay’. • They are means-tested in relation to household income, but paid to an individual in the household. The system is complex and extends to middle income households. • Child Tax Credit is paid to whoever is nominated the main carer in the family, most often the woman. • Child Tax Credits reduced for middle-income families, with loss of independent income for women, who may have a low or no income of their own, making them more reliant on their husbands. • If they have to pay for child care from their own pockets, they may no longer be able to afford it and may be pushed out of the labour market. • The increase in Child Tax Credit for low-income families boosts the income of mothers if they are nominated as the main carer. However, the extra £ 150 will quickly be absorbed by the rising costs associated with rise of VAT to 20% in January 2011. 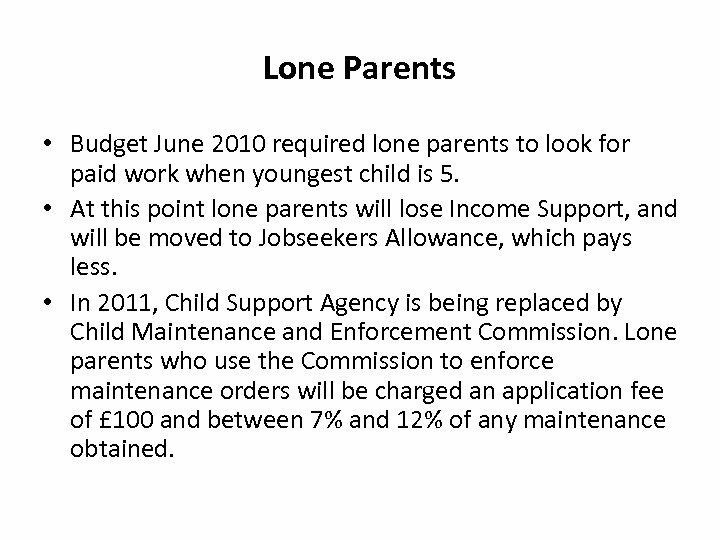 Lone Parents • Budget June 2010 required lone parents to look for paid work when youngest child is 5. • At this point lone parents will lose Income Support, and will be moved to Jobseekers Allowance, which pays less. • In 2011, Child Support Agency is being replaced by Child Maintenance and Enforcement Commission. Lone parents who use the Commission to enforce maintenance orders will be charged an application fee of £ 100 and between 7% and 12% of any maintenance obtained. UK October 2010 Spending Review • Multi-year plan for large cuts in public expenditure on public services- in real terms , about 12% in total over period 2010/11 to 2014/15. • Likely to reduce services that enable women to combine paid work and unpaid care. • Office of Budgetary Responsibility estimates will reduce public sector employment by 500, 000. • 65% of public sector jobs held by women. 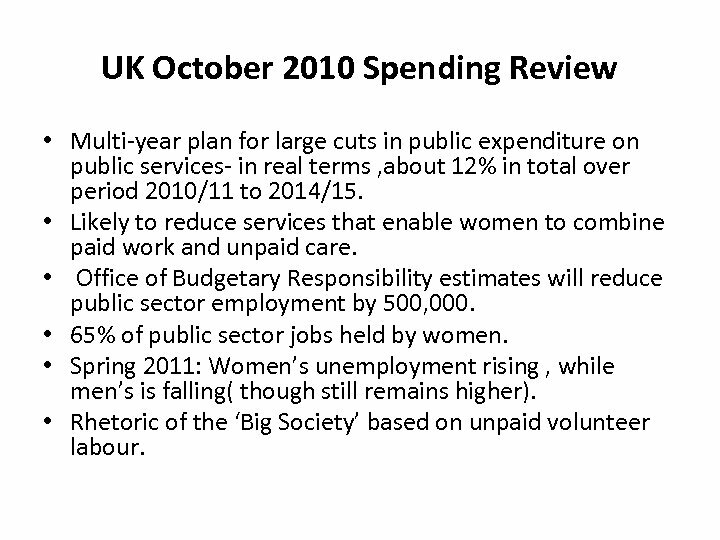 • Spring 2011: Women’s unemployment rising , while men’s is falling( though still remains higher). • Rhetoric of the ‘Big Society’ based on unpaid volunteer labour. 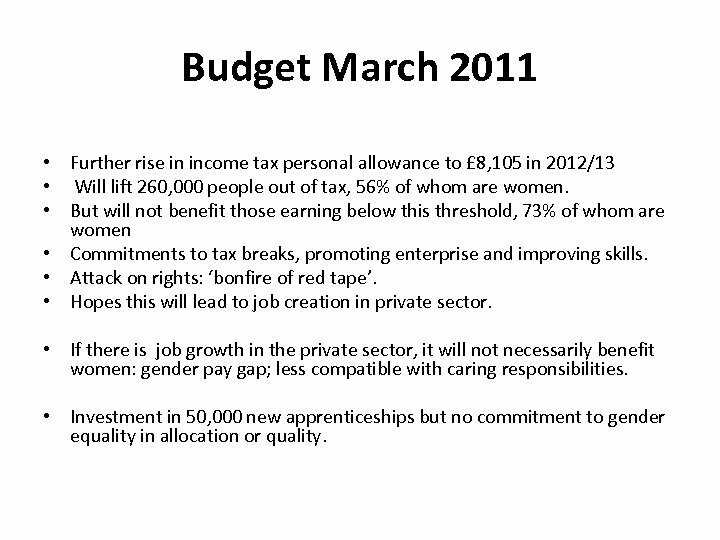 Budget March 2011 • Further rise in income tax personal allowance to £ 8, 105 in 2012/13 • Will lift 260, 000 people out of tax, 56% of whom are women. • But will not benefit those earning below this threshold, 73% of whom are women • Commitments to tax breaks, promoting enterprise and improving skills. • Attack on rights: ‘bonfire of red tape’. • Hopes this will lead to job creation in private sector. • If there is job growth in the private sector, it will not necessarily benefit women: gender pay gap; less compatible with caring responsibilities. • Investment in 50, 000 new apprenticeships but no commitment to gender equality in allocation or quality. 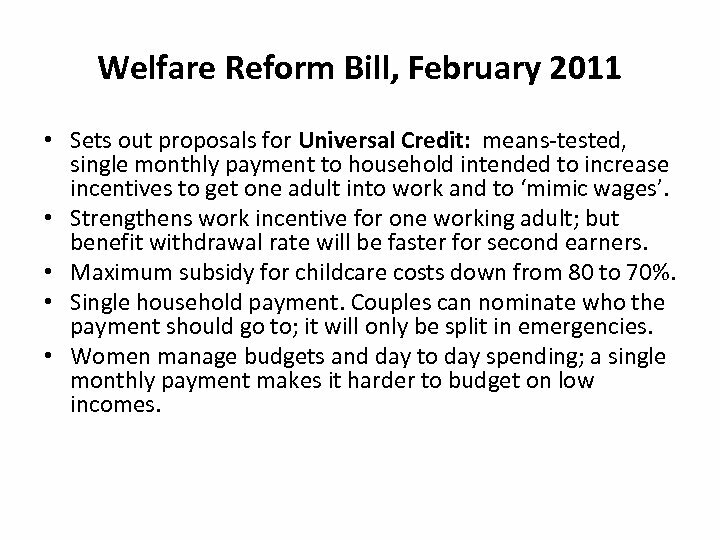 Welfare Reform Bill, February 2011 • Sets out proposals for Universal Credit: means-tested, single monthly payment to household intended to increase incentives to get one adult into work and to ‘mimic wages’. • Strengthens work incentive for one working adult; but benefit withdrawal rate will be faster for second earners. • Maximum subsidy for childcare costs down from 80 to 70%. • Single household payment. Couples can nominate who the payment should go to; it will only be split in emergencies. • Women manage budgets and day to day spending; a single monthly payment makes it harder to budget on low incomes. 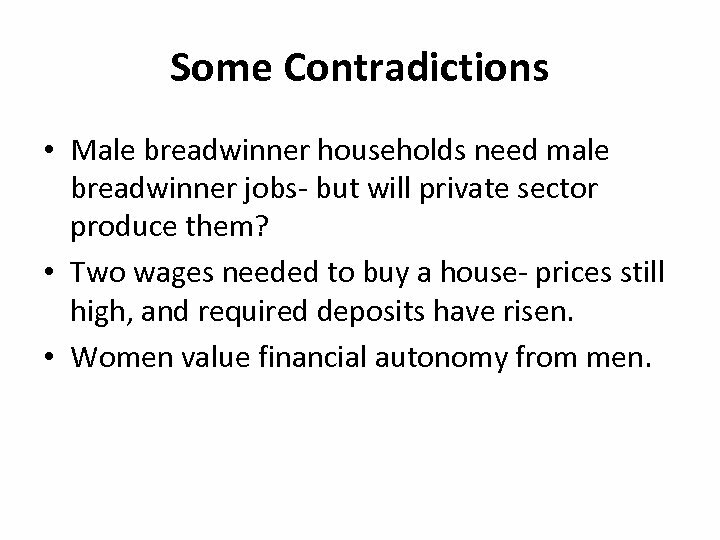 Some Contradictions • Male breadwinner households need male breadwinner jobs- but will private sector produce them? • Two wages needed to buy a house- prices still high, and required deposits have risen. • Women value financial autonomy from men.